At 22, skier Mikaela Shiffrin is about to represent the United States in PyeongChang at her second Olympics. She's an absolute master of slalom, the event where skiers race through gates for the fastest run time, and was described by The New Yorker as "a bright, affable American who dominates her corner of the sport with the kind of predictability and grace that draws in casual viewers, awes the experts, and inspires a lot of super-slo-mo check-that-out." Put simply, she's already been on a Wheaties box, and she's only becoming a bigger deal. You'll be hearing a lot about her in the next few weeks, so get acquainted now. Shiffrin lives and grew up in Vail, Colorado, where she was born on March 13, 1995. Her parents were both competitive skiers and subscribed to the so-called 10,000 hours rule. They were pulling Shiffrin around on skis on the driveway when she was 3, and by the time she was in kindergarten she was on the slopes taking lessons. She went on to school at Vermont's Burke Mountain Academy, a boarding school centered on ski racing that had around a dozen students per grade. Not long after, Shiffrin was competing internationally. Shiffrin made her World Cup debut at 15 and soon started dominating the skiing world. At 16, she became the youngest skier to win a US National Championship. At 18, she became the youngest slalom champion in Olympic history. Now 22, she has 31 career wins at the World Cup, which is the second most World Cup victories by a woman, behind Lindsey Vonn who has 77. 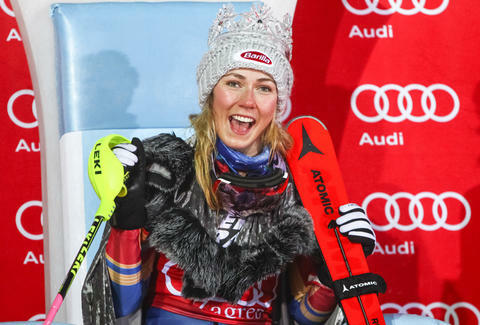 Shiffrin is currently the reigning World Cup overall champion. What's that sticker on her helmet? Shiffrin always wears a sticker on her helmet that reads "ABFTTB," or "Always Be Faster Than The Boys." Three-time US Olympian Heidi Voelker signed a poster for a 6-year-old Shiffrin with that acronym on it, and it's stuck with her ever since. How well is she expected to do in PyeongChang? At least according to that New Yorker profile, Shiffrin is expected to win at least one gold medal but could end up taking home three. With a record like hers, it certainly seems possible. James Chrisman is a News Writer at Thrillist who has yet to compete in the Olympics. Send news tips to news@thrillist.com and follow him on Twitter @james_chrisman2.